SCA Judge Boissie Mbha says section of Intimidation Act is unconstitutional, Dave Chambers, Business Day (21 June 2018). Apartheid legal relic goes down in flames at appeal court, Dave Chambers, Times Live (21 June 2018). Dozens of displaced families in limbo, waiting for Joburg to find them accommodation, Nonkululeko Njilo, Business Day (25 June 2018). Poverty, evictions and court disputes: The sad reality of eThekwini's poor people, Lizeka Maduna, The Daily Vox (25 June 2018). Interview with SERI research and advocacy officer, Edward Molopi, discussing Gauteng's plans to expropriate unused land without compensation, SABC Morning Live (20 June 2018). Court allows Durban evictees to retunr to their homes, Musawenkosi Cabe and Dennis Webster, Ground Up (19 June 2018). Still no solution for Wembley Stadium Families, Zoë Postman, Ground Up (11 June 2018). Podcast of an interview with SERI research associate, Michael Clark, discussing SERI's joint submission on informal settlements to the United Nations (UN) Special Rapporteur on the right to adequate housing on Valley FM (1 June 2018). Found not guilty by Court, Marikana activist warns of cops pursuing 'political agendas', Greg Nicolson, Daily Maverick (22 May 2018). Lack of evidence sees Marikana activist Napoleon Webster cleared of murder, Staff Reporter, IOL News (22 May 2018). Court clears Napoleon Webster of murder due to lack of evidence, Masechaba Sefularo, EWN (22 May 2018). Murder charges withdrawn against Marikana activist and five others, Ernest Mabuza, Times Live (22 May 2018). 'No one cares': Residents lose hope amid decay of 'hijacked' homes in Johannesburg, Cara Anna, Washington Post (14 May 2018). PICS: 'No one cares' about inhabitants of Joburg's 'hijacked' buildings, Cara Anna, IOL News (14 May 2018). Podcast of an interview with SERI researcher, Kelebogile Khunou, discussing what employers need to know about domestic workers’ rights, Power FM (9 May 2018). Podcast of an interview with SERI research associate, Michael Clark, discussing the laws governing public protests in South Africa, Voice of the Cape (8 May 2018). How South Africa should tackle the redistribution of land in urban areas, Sarita Pillay, The Conversation (7 May 2018). Helping hand for domestic workers, Karabo Ledwaba, Sowetan Live (7 May 2018). Podcast of an interview with SERI researcher, Kelebogile Khunou, discussing the challenges face by domestic workers in South Africa, Cape Talk (1 May 2018). Hijacked buildings and 'shock and awe' tactics in Joburg's low-income black neighborhoods, Daylin Paul, City Limits (1 May 2018). Know your rights: When can you be evicted and how?, Mluleki Marongo, Ground Up (26 April 2018). Interview with SERI's Stuart Wilson discussing the law and evictions, [watch from 1:19.50] SABC Newsroom (18 April 2018). Land expropriation: In the problem with the law or the implementation of the law, Nkateko Mabasa, Daily Maverick (16 April 2018). Living in a place where the walls fall down, Amanda Watson, The Citizen (15 April 2018). Interview with SERI's Nomzamo Zondo disussing the need to safe temporary alternative accommodation in the wake of the Davies Street wall collapse in Doornfontein, SABC Morning Live (11 April 2018). Doornfontein building collapse: City can't escape safe housing responsibility, SERI says, Shaazla Ebrahim, The Daily Vox (11 April 2018). Podcast of an interview with SERI's Edward Molopi on the state of housing in inner-city Johannesburg on "The Talking Point Show", SAFM (11 April 2018). Podcast of SERI's Nomzamo Zondo discussing the need for the City of Johannesburg to provide emergency housing to those living in unsafe buildings, 702 (10 April 2018). Podcast of an interview with SERI's Nomzamo Zondo on the building that collapsed on Davies Street in Doornfontein, Power FM (10 April 2018). #Doornfontein parents has begged for alternative housing, African News Agency Reporter, IOL News (10 April 2018). Residents of collapsed Johannesburg building has been waiting 8 months for emergency housing, Staff Reporter, Huff Post (10 April 2018). Mom whose son died in Doornfontein wall collapse recalls his last words, Khaya Koko, IOL News (10 April 2018). Occupants in building where wall fell waited 8 months for emergency housing, Staff Reporter, Times Live (9 April 2018). Doornfontein wall collapse: City blasted over 'unsafe' accommodation, Staff Reporter, IOL News (9 April 2018). Jozi's poor denied water, Dikeledi Molobela, The New Age (26 March 2018). Video interview with Thulani Nkosi on Unlawful Occupations in Gauteng, Carte Blanche (19 March 2018). Traders vs Transnet: court case has consequences for informal businesses, Ohene Yaw Ampofo-Anti, Ground Up (19 March 2018). Senior police officials to appear in court for Marikana massacre, Athandiwe Saba, Mail & Guardian, (15 March 2018). Mashaba puts Joburg at the forefront of expropriation - but his inner-city plan is doomed, Verashni Pillay, Business Day (12 March 2018). Inner City Blues: Joburg considers test case for expropriation of run-down buildings, Greg Nicolson, Daily Maverick (7 March 2018). Jozi's expropriation plan, Ntombi Nkosi, The New Age (28 February 2018). #RhodesWar: Women need to reclaim their bodies, Ndileka Lujabe, City Press (28 February 2018). Rights group calls on Cyril Ramaphosa to keep his promise to atone for Marikana, Ernest Mabuzo, Business Day (22 February 2018). Marikana victims' families urge Ramaphosa to turn his promises into action, Gia Nicolaides, Eye Witness News (22 February 2018). Families of slain Marikana miners call on Rampahosa to turn his promises into action, Alex Mitchley and Jan Gerber, News 24 (22 February 2018). This is what the budget would look like if it took people seriously, Hopolang Selebalo, Business Day (20 February 2018). Slovo Park finally getting electricity, Sanele Gumada, The Citizen (20 February 2018). Apartheid-era Gatherings Act declared unconstitutional, Barbara Maregele, Ground Up (24 January 2018). Scathing judgment against Ekurhuleni municipality for 17-year housing delay, Ohene Yaw Ampofo-Anti, Ground Up (18 January 2018). Inner-city housing: Untying the legal knots of evictions, Tom Nevins, Business Day (15 January 2018). 'State must apologise and compensate Marikana families' - legal representative, Litha Mpondwana, 702 News (12 December 2016). Marikana: More than four years after the massacre that shocked the world, charges against police finally laid, Greg Nicolson, Daily Maverick (12 December 2016). Legal enmity to Mashaba’s inner-city project, Dewald van Rensburg and S'thembile Cele, City Press (11 December 2016). Playing into the Hands of the Securocrats: A response to Adam Habib, Jane Duncan, Daily Maverick (8 December 2016). Podcast of Deneco Dube of CSAAWU discussing farmworkers' struggles, Cliff Central (6 December 2016). Mashaba’s Johannesburg turns 100 days old, and politics begin, Greg Nicolson, Daily Maverick (1 December 2016). Court dismisses Rhodes University interdict bid, Adrienne Carlisle, Daily Dispatch (1 December 2016). City of Cape Town vows to stop land invasions, Siyabonga Sesant, Weekend Argus (12 November 2016). Housing, social rights activists meet at Urban Land Justice Colloquium, SABC News (12 November 2016). University interdicts: what do they mean and to whom do they apply?, Safura Abdool Karim, GroundUp (7 November 2016). Video of Thulani Nkosi discussing the Tlale judgment, Jacaranda News (3 November 2016). Video of judgment being handed down in Tlale, Jacaranda News (3 November 2016). University students want to interdict Wits over exams‚ claim trauma‚ 'superficial' teaching, Jan Bornman, Sowetan (31 October 2016). University students want to interdict Wits over exams, Jan Bornman, Times Live (31 October 2016). Wits students apply for interdict to delay exams by two weeks, Jan Bornman, Business Day (31 October 2016). Podcast of Martin Mosweu discussing informal trade in Johannesburg, Wits Radio Academy (27 October 2016). Inside Braamfontein’s place of refuge, Kim Harrisberg, GroundUp (12 october 2016). When a ‘radiological hotspot’ is your home, Sheree Bega, The Star (12 October 2016). Holy Shield: #FeesMustFall priest tells of his day of terror, Ranjeni Munusamy, Daily Maverick (11 October 2016). Podcast of Stuart Wilson discussing development and displacement in Johannesburg's inner city, PowerFM (4 October 2016). Podcast of Lauren Royston discussing Johannesburg's inner city housing crisis, PowerFM (4 October 2016). 'Regeneration should be for all': will change in Johannesburg benefit its poorest residents?, Jason Burke, The Guardian (2 October 2016). Ground-breaking Marikana case heads to court, Safura Abdool Karim, GroundUp (16 September 2016). Interdict case postponed, Loyiso Dyongman, Grocott's Mail (5 September 2016). 'Dear Mandela' film-maker launches new short film collection, Roxanne Henderson, Sunday Times (30 August 2016). Abattoir workers win unfair dismissal case on appeal, Ashleigh Furlong, GroundUp (22 August 2016). Video of Naadira Munshi discussing Marikana massacre, SABC Newsroom (18 August 2016). #RememberMarikana: the miners killed at Marikana on 13 and 16 August 2012, Mail and Guardian (16 August 2016). BIG DEBATE: Twenty Years of the Constitution, featuring Nomzamo Zondo, Zak Yacoob, and SERI clients from the SPCDF, the TCC, MACODEFO, and SAITF (1 August 2016). From slum flat to... slum flat, Gabi Falanga, The Star (1 August 2016). Podcast of Nkosinathi Sithole discussing tenants rights, Wits Radio Academy - Law Focus (21 July 2016). Video of Stuart Wilson discussing municipal participation at the Second Political Cafe, Democracy Works (21 July 2016). South Africa has been key to putting informal settlements on the Habitat III agenda, Brendon Bosworth, Citiscope (14 June 2016). Let’s weave informal traders into city fabric, Stephen Timm, Business Day (13 June 2016). Podcast on Kiribilly eviction, SABC News (8 June 2016). Podcast of Lindokuhle Mdabe discussing the Hammanskraal evistions, WITS Radio Law Focus (5 June 2016). ‘Breathtakingly inaccurate’: Phiyega castigated as Claassen inquiry moves to a close, Greg Nicolson, Daily Maverick (3 June 2016). Op-Ed: Expansion of low-cost housing for all is a necessity for inner-city Johannesburg, P Misago and M Wilhelm-Solomon, Daily Maverick (3 June 2016). Phiyega mustn't be spared testimony by Marikana survivors and widows – lawyers, Pontsho Pilane, Mail and Guardian (31 May 2016). Key Lonmin exec was SSA spook - report, Pieter-Louis Myburgh, Rapport (29 May 2016). Sanef, R2K raise concern over SABC ‘censorship’, Ndileka Lujabe, News24 (27 May 2016). Abattoir workers taking dismissals to appeals court, Nomahlubi Jordaan, Business Day (24 May 2016). Robertson abattoir workers hope to head back to Labour Court, Ashleigh Furlong, GroundUp (24 May 2016). Spouses have no right to sleep together at shelters - SCA, Jeanette Chabalala, News24 (19 May 2016). Marikana: Phiyega’s inquiry begins as compensation is still elusive, Greg Nicolson, Daily Maverick (5 May 2016). SERI welcomes judgment which throws lifeline to credit consumers, Ernest Mabuza, Times LIVE (21 April 2016). Mother of poisoned farmworker demands answers, Barbara Maregele, GroundUp (15 April 2016). Jackie Dugard discussing the High Court victory for the Slovo Park community on the Iman Rappetti show, PowerFM (8 April 2016). Nomzamo Zondo discussing the High Court victory for the Slovo Park community on the John Robbie show, 702 (8 April 2016). Sanco welcomes judgment on Slovo Park upgrades, Jabulile S. Ngwenya, IOL (6 April 2016). Houses for 10 000 Slovo Park settlers, Anna Cox, The Star (6 April 2016). Radio interview with Lwazi Mtshiyo on the High Court victory for the Slovo Park community, Radio 786 (6 April 2016). Video, Slovo Park settlement to get upgrade, eNCA (6 April 2016). Court orders municipality to better Slovo Park, Roxanne Henderson, Times LIVE (5 April 2016). City of Joburg acted unlawfully on Slovo Park - High Court, Naledi Shange, News24 (5 April 2016). Interview with Nomzamo Zondo, Residents of the Slovo Park informal settlement win 20-year battle, SAfm (5 April 2016). Joe Slovo Park residents hopeful service delivery will improve, Govan Whittles, EWN (5 April 2016). High Court victory for Slovo Park residents in prime time news (at 4:26), eNCA (5 April 2016). Video, Court orders city of Joburg to deliver services in Slovo Park, SABC News (5 April 2016). Slovo residents win 20 year court battle over residential upgrade, Wisani Makhubele, SABC News (5 April 2016). Victory for Slovo Park settlers, Penelope Mashego, Business Day (5 April 2016). Court orders Slovo Park upgrade, Naledi Shange, News24 (5 April 2016). Radio interview with Mbekezeli Benjamin and Dennis Webster on informal trade in Johannesburg's inner city, SAfm (7 March 2016). Justice comes with complex baggage, Niren Tolsi, Mail & Guardian (26 February 2016). Presidency: Marikana compensation talks to begin in January, Greg Nicolson, Daily Maverick (9 December 2015). Making African cities open to street trading: Q&A with Professor Claire Benit-Gbaffou, Greg Nicolson, Daily Maverick (9 December 2015). Marikana: WHAT compensation discussions?, Greg Nicolson, Daily Maverick (7 December 2015). Casualties of Cola, Daily Maverick Chronicle (7 December 2015). SAHRC: People need access to land and housing, Koketso Moeti, Daily Maverick (24 November 2015). We're like cockroaches to the City, say Johannesburg residents, Sarita Pillay, GroundUp (20 November 2015). Affordable city housing: A model and building Joburg must maintain, Greg Nicolson, Daily Maverick (19 November 2015). The question of human rights violations against the #feesmustfall protesters, Jane Duncan, The Conversation (9 November 2015). Six students and informal leader released, Sowetan (26 October 2015). Victory for KZN shackdwellers, Sowetan (20 October 2015). TV interview with Bhavna Ramji on illegal evictions (watch from 46:00), SABC Newsroom (16 October 2015). Video of civil society debate at Daily Maverick's The Gathering 2015, in which Nomzamo Zondo took part (15 October 2015). Use the law, not violence, say activists at land conference, Barbara Maregele and Ashleigh Furlong, GroundUp (14 October 2015). Land conference hears stories of hope and despair, Barbara Maregele and Ashleigh Furlong, GroundUp (14 October 2015). Marikana families still in dark over settlements: Socio-Economic Rights Institute, Adam Wakefield, Times Live (10 October 2015). Podcast of interview with Dennis Webster and Brian Phaaloa (SAITF General Secretary) on the launch of SERI's informal trade research, Power FM (1 October 2015). Video segment on informal trade in Johannesburg, including interview with Brian Phaaloa (SAITF General Secretary) and coverage of the launch of SERI's informal trade research report, SABC (30 September 2015). Recognise informal traders, report urges, Xanderleigh Dookey, Business Day (30 September 2015). City of Joburg trading laws too restrictive, Tshepo Phagane, SABC News (29 September 2015). More inclusive approach needed on Joburg informal traders - report, Adam Wakefield, News 24 (29 September 2015). ConCourt agrees on Marikana miners' legal aid, Jenni Evans, New 24 (23 September 2015). ConCourt dismisses Legal Aid's leave to appeal, Sarah Evans, Mail and Guardian (22 September 2015). Marikana: Another delay and a hint of compensation, Greg Nicolson, Daily Maverick (15 September 2015). Court rules in favour of evicted Hillbrow residents, Masego Rahlaga, Eyewitness News (10 September 2015). Waiting for the state: politics of public housing in South Africa, Saskia Greyling and Sophie Oldfield, The Conversation (10 September 2015). Eviction ruling spurs on shack dwellers, Kwanele Sosibo, Mail and Guardian (28 August 2015). MEC sounds alarm on land invasions, Lee Rondganger, IOL News (26 August 2015). Court victory vindicates shack dwellers' rights, Daneel Knoetze, GroundUp (26 August 2015). Shack dwellers get their day in court, Sne Masuku & Yadhana Jadoo, The Citizen (21 August 2015). Rights group wins major victory limiting evictions, video on eNCA (21 August 2015). Court Victory for Durban Shack Dwellers, Amanda Khoza, News24 (21 August 2015). Evicting ‘land invaders’ unconstitutional, Tania Broughton, IOL News (21 August 2015). Durban High Court stops thousands of evictions, Times LIVE (20 August 2015). Much-anticipated ruling on future of shack dwellers, Sne Masuku, The Citizen (20 August 2015). TV Interview with Naadira Munshi on the Marikana civils claims and the third commemoration of the massacre, SABC Newsroom (17 August 2015). Marikana families to Nhleko: #PayUsTheMoney, Greg Nicolson, Daily Maverick (14 August 2015). Marikana: A State Of No Apologies, Niren Tolsi, The Con (14 August 2015). Families of Marikana mine workers file civil claims against government, The Sowetan (11 August 2015). Farmworkers' union challenges Labour Court ruling, EWN (7 July 2015). MOU to Address Housing Needs in Winnie Mandela, AllAfrica (7 July 2015). Union goes to highest court in fight for survival, Mariska Morris, GroundUp (7 July 2015). Lonmin’s licence is under attack, Dineo Faku, Business Report (6 July 2015). Video of Dumisa Ntsebeza discussing government accountability at Marikana, ENCA (5 July 2015). Video segment on release of Marikana report, including interview with Nomzamo Zondo, Carte Blanche (30 June 2015). Podcast of interview with Kathleen Hardy on release of Marikana report, Wits Radio Academy (30 June 2015). Podcast of interview with Grace Gomba and Dennis Webster on release of Marikana report, CliffCentral (30 June 2015). DA’s Marikana bill will test ANC, Carol Paton, Business Day Live (29 June 2015). Presidency disregards families of slain Marikana miners, Sarah Evans, Mail & Guardian (26 June 2015). Marikana Report: The continuing injustice for the people of a lesser God, Ranjeni Munusamy, Daily Maverick (26 June 2015). Zuma’s Speech no Succour for Marikana Widows, Niren Tolsi, The Con Mag (25 June 2015). Marikana: All we want from the state is an opportunity for honest engagement, Fairouz Nagia-Luddy, Groundup (15 June 2015). Judge dismisses Marikana report release application, Valeska Abreu, The Citizen (15 June 2015). The Gathering 2015: Fired up social justice panelists roast deputy justice minister, Greg Nicolson, The Daily Maverick (11 June 2015). Marikana mineworkers accuse Zuma of being ‘irrational’, SABC Digital News (8 June 2015). Marikana report: The pain while President Zuma applies his mind, Daily Maverick (8 June 2015). A court application against the Ekurhuleni Municipality, SABC Digital News (5 June 2015). Justice restores the dignity of the poor, Niren Tolsi, Mail & Guardian (29 May 2015). Marikana report: Despite the release promise, pressure on Zuma persists, Greg Nicolson, Daily Maverick (28 May 2015). Families of Marikana miners send Zuma a deadline,Times Live (27 May 2015). Who will get legal aid after Marikana inquiry?, Sarah Evans, Mail & Guardian (14 May 2015). Land occupations: All eyes on KZN court ruling, Paddy Harper, City Press (11 May 2015). Podcast of interview with Bhavna Ramji on the Marikana funding case in the Constitutional Court, SABC News (13 May 2015). Marikana miners and family reflect on commission experiences, Rafieka Williams, Wits Vuvuzela (11 May 2015). Mayor, city manager fall foul of top court, Gabi Falanga, The Star (11 May 2015). Young, black and angry – Little hope for millions, Finweek (8 May 2015). TV interview with Dara Kell and Mazwi Nzimande on the Dear Mandela screening tour, SABC Morning Live (2 May 2015). Radio interview with Dennis Webster on his Operation Ke Molao op-ed, PowerFM (20 April 2015). Forced removals and evictions could create a cycle of illegal squatting in SA, Radio 702 (30 March 2015). Marikana report to be submitted, eNCA News (31 March 2015). TV interview with Teboho Mosikili on the handing over of the Marikana Commission report, eNCA News (31 March 2015). Podcast of an interview with SERI executive director Stuart Wilson, on evictions in South Africa, Radio 702 (30 March 2015). Cities are publicly accountable, appeal court rules, Sarah Evans, Mail and Guardian (20 March 2015). Hundreds left homeless after Jeppestown evictions, Aurelie Kalenga, EyeWitness News (19 March 2015). Rough and ready justice at the magistrate’s courts, Franny Rabkin, Business Day (5 March 2015). Gentrification in Johannesburg isn’t good news for everyone, Kenichi Serino, Al Jazeera America (4 March 2015). Socio-economic implications of the 2015 National Budget Speech, TV panel discussion with Lauren Royston, ANN7 (25 February 2015). Commission shifts focus to service-delivery issues, Kingdom Mabuza, Times Live (24 February 2015). Landlord caught in fees scam, Roxanne Henderson, Times Live (22 February 2015). Sona 2015: The walk falls short of the talk, Laura Grant, Mail and Guardian (13 February 2015). Sisulu drafting amendments to eviction laws, Daneel Knoetze, GroundUp (4 February 2015). Evictions - acting illegally can backfire, Private Property (22 January 2015). Saved from homelessness, Zodidi Mhlana, The New Age (19 January 2015). Poor people do win too, Roxanne Henderson, The Times (18 January 2015). Property developers lose case to evict pensioners, Saturday Star (17 January 2015). Court to decide on fate of elderly, Zodidi Mhlana, The New Age (16 January 2015). Working on the Farm, Living on the Margins by Kimon de Greef, The Con (10 December 2014). Eviction by the back door by Daneel Knoetze, GroundUp (1 December 2014). Marikana Commission: Compensate the relatives by Greg Nicolson, Daily Maverick (14 November 2014). Families want to know: was there no other way? by Franny Rabkin, Business Day (12 November 2014). Mr President, South Africa is not the only country giving free housing to the poor, Africa Check (6 November 2014). Marikana suit on cards by Dudu Dube, The New Age (23 October 2014). Podcast of Lauren Royston and the Gauteng MEC for Human Settlements discussing informal settlements, KayaFM (23 October 2014). Rights group fights 'inhumane' eviction by Sarah Evans, Mail and Guardian (16 October 2014). 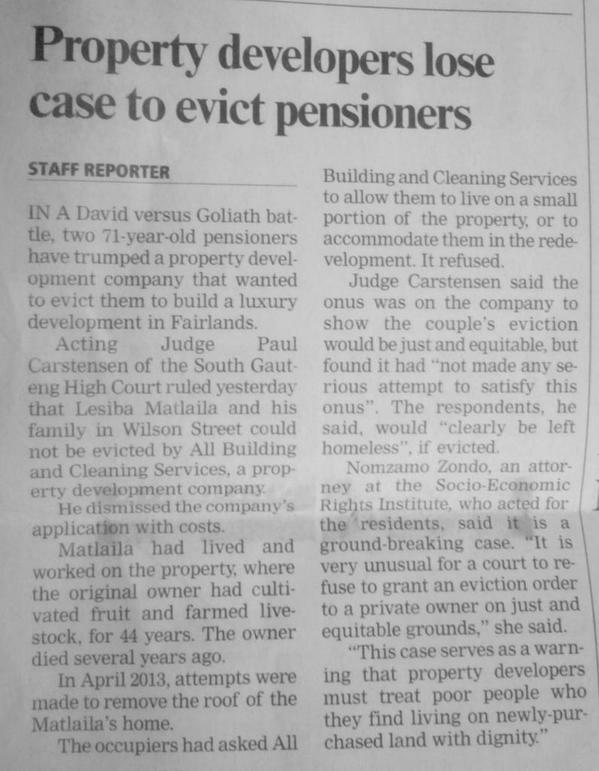 Eviction of couple, 71, will be 'unjust' by Zodidi Mhlana, The New Age (16 August 2014). Elderly face eviction from farm by Zoe Mahopo, Sowetan (16 October 2014). Thembelihle and the Criminalisation of Dissent by Koketso Moeti, NGO Pulse (10 October 2014). Joburg's street traders: Swept into a corner by Relebone Rirhandzu Myambo, The Con (8 October 2014). Law used to 'clamp down on dissent' by Phillip de Wet, Mail and Guardian (19 September 2014). Jo'burg residents battle Red Ant evictions by Rapula Moatshe, Mail and Guardian (19 September 2014). Criminalising protest and dissent by Daneel Knoetze, GroundUp (18 September 2014). Breaking the Myth of ‘Demobilised’ Communities by Koketso Moeti, NGO Pulse (17 September 2014). Legal Aid SA 'can't fund injured and arrested Marikana miners' by Sarah Evans, Mail and Guardian (7 September 2014). Jozi shelter rules ‘unconstitutional’ by Anna Cox, The Star (25 August 2014). Legal challenge to Intimidation Act by Zelda Venter, Pretoria News (25 August 2014). Ekuthuleni shelter rules infringed on rights, disrupted families: judge by Roxanne Henderson, TimesLive (23 August 2014). Temporary accommodation rules 'unconstitutional' by Stephen Grootes, Eye Witness News (22 August 2014). Podcast of interview on housing waiting lists with SERI researcher Kate Tissington and Xolani Xundu from DHS, Kaya FM (20 August 2014). Grief overflows at Marikana Commission by Gabi Falanga, Mail and Guardian (15 August 2014). Marikana Commission: Families speak by Greg Nicholson, Daily Maverick (14 August 2014). ConCourt to hear Bapsfontein caseIOL News (11 August 2014). Former shack dwellers’ official acquitted by Noelene Barbeau, Daily News (8 August 2014). Robertson Abattoir was “hell”, Daneel Knoetze, GroundUp (29 July 2014). Seri lambastes false media report, News24 (20 July 2014). Lwandle blame-game will not fix underlying housing issues by Rebecca Davis, Daily Maverick (15 July 2014). Forced removals: 2014-style by Leonie Wagner, Times (15 July 2014). Straatverkopers in Johannesburg vechten voor hun bestaan by Jennifer Groeneveld, Vers Pers (11 July 2014). Illegal Durban evictions and the meaning of emancipatory democracy, op-ed by Raymond Suttner, Daily Maverick (24 June 2014). Evictions cause rift between City and SERI, New Age (17 June 2014). Joburg leaving evictees in the cold, News24 (13 June 2014). City of Jo'burg blamed for not providing homes to evictees by Kwanele Sosibo, Mail and Guardian (12 June 2014). ConCourt hands victory to evicted 390 by Noelene Barbeau, Daily News (9 June 2014). Madlala villagers can appeal demolition by SAPA, IOL News (6 June 2014). Avert forced removals by giving the rich's land to the poor by Jared Sacks, Mail and Guardian (6 June 2014). Podcast of an interview with SERI executive director, Stuart Wilson, and MMC for Housing in the City of Johannesburg on an eviction in Alexandra township, 702 Talk Radio (5 June 2014). Abahlali’s public violence trial begins by Noelene Barbeau, Daily News (4 June 2014). How South Africa is faring in the provision of free basic services by Koketso Moeti, GroundUp News (26 May 2014). State gets 'off the hook' on Marikana by Gabi Falanga, Mail and Guardian (23 May 2014). Support group tells Farlam not to be part of Marikana 'whitewash' by Kwanele Sosibo, Mail and Guardian (15 May 2014). Yilungelo Lakho: Lack of affordable accommodation in cities and hijacked buildings, consumer rights television programme featuring SERI attorney Nomzamo Zondo, SABC 1 (12 May 2014). Why Is There Not Enough Affordable Rental or Social Housing for the Poor In South Africa's Cities? by Louise Scholtz, SACSIS (7 May 2014). Addressing South Africa's housing backlog, television interview with SERI executive director Stuart Wilson, CNBC Africa (7 May 2014). 20 years of housing delivery in South Africa, City Press (2 May 2014). In Johannesburg, Once Known For Apartheid, Gentrification Means Displacement For The Poor by Skyler Reid, International Business Times (25 April 2014). Good news for a change - especially for informal traders by Gushwell Brooks, Daily Maverick (22 April 2014). Podcast of interview with SERI legal researcher Michael Clark discussing the need to more affordable low-cost rental accommodation in the City of Johannesburg, PowerFM (14 April 2014). Urbanisation: Talk is cheap, blogpost by Lauren Royston and Michael Clark, Urban Joburg (11 April 2014). Evictions an attack on dignity: Traders by Tshepo Phagane, SABC News (5 April 2014). ConCourt sets aside high court order for informal traders, Citizen (4 April 2014). Podcast of interview with SERI's executive director, Stuart Wilson, discussing the implications of the Public Protector's Nkandla report and South Africas progress on human rights, Talk Radio 702 (21 March 2014). Podcast of interview with SERI's executive director, Stuart Wilson discussing the implications of the Public Protector's Nkandla report, Radio France Internationale (20 March 2014). SA housing: A better life for all? by Nontobeko Sibisi, eNCA (12 March 2014). Government's plans and promises to meet housing needs in South Africa, TV panel discussion with Lauren Royston, Mbulelo Tshangana and Josette Cole, eNCA (10 March 2014). Mtetwa arrest breached rule of the law, report, New Zimbabwean (25 February 2014). President Jacob Zuma's State of the Nation address fact-checked by Kate Wilkinson, Nechama Brodie, Sintha Chiumia and Julian Rademeyer, Africa Check (14 February 2014). Shack dwellers want removal order set aside by Ernest Mabuza, Business Day (14 February 2014). Shack dwellers head for ConCourt by Nosipho Mngoma, Daily News (13 February 2014). Putting a stop to lousy deals for debtorsby Ernest Mabuza, The Times (24 January 2014). Land invaders or victims? by Ernest Mabuza and Nivashni Nair, The Times (17 January 2014).